For the album by Leslie Spit Treeo, see Chocolate Chip Cookies (album). A chocolate chip cookie with chocolate dough, sprinkled with powdered sugar and paired with milk. 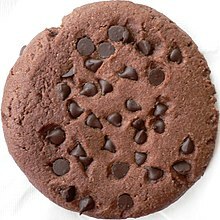 A chocolate chip cookie is a drop cookie that originated in the United States and features chocolate chips or chocolate morsels as its distinguishing ingredient. Circa 1938, Ruth Graves Wakefield added chopped up bits from a Nestlé semi-sweet chocolate bar into a cookie. The traditional recipe starts with a dough composed of butter and both brown and white sugar, semi-sweet chocolate chips and vanilla. Variations on the recipe may add other types of chocolate, as well as additional ingredients such as nuts or oatmeal. There are also vegan versions with the necessary ingredient substitutions, such as vegan chocolate chips, vegan margarine, egg substitute, and so forth. A chocolate chocolate chip cookie uses a dough flavored with chocolate, before chocolate chips are mixed in. 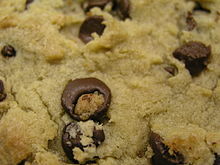 The chocolate chip cookie was invented by the American chef Ruth Graves Wakefield and chef Sue Brides in 1938. She invented the recipe during the period when she owned the Toll House Inn, in Whitman, Massachusetts. In this era, the Toll House Inn was a popular restaurant that featured home cooking. It is often incorrectly reported that she accidentally developed the cookie, and that she expected the chocolate chunks would melt, making chocolate cookies. In fact, she stated that she deliberately invented the cookie. She said, "We had been serving a thin butterscotch nut cookie with ice cream. Everybody seemed to love it, but I was trying to give them something different. So I came up with Toll House cookie." She added chopped up bits from a Nestlé semi-sweet chocolate bar into a cookie. The original recipe in Toll House Tried and True Recipes  is called "Toll House Chocolate Crunch Cookies." Chocolate chip cookies are often paired with a glass of milk. The fat particles of the milk enhance the tasting sensation of the sugar from the cookies, giving a smoother mouthfeel. Although the Nestlé's Toll House recipe is widely known, every brand of chocolate chips, or "semi-sweet chocolate morsels" in Nestlé parlance, sold in the U.S. and Canada bears a variant of the chocolate chip cookie recipe on its packaging. Almost all baking-oriented cookbooks will contain at least one type of recipe. Chocolate chip cookies are commonly made with white sugar; brown sugar; flour; a small portion of salt; eggs; a leavening agent such as baking powder; a fat, typically butter or shortening; vanilla extract; and semi-sweet chocolate pieces. Some recipes also include milk or nuts (such as chopped walnuts) in the dough. Depending on the ratio of ingredients and mixing and cooking times, some recipes are optimized to produce a softer, chewy style cookie while others will produce a crunchy/crispy style. Regardless of ingredients, the procedure for making the cookie is fairly consistent in all recipes: First, the sugars and fat are creamed, usually with a wooden spoon or electric mixer. Next, the eggs and vanilla extract are added followed by the flour and leavening agent. Depending on the additional flavoring, its addition to the mix will be determined by the type used: peanut butter will be added with the wet ingredients while cocoa powder would be added with the dry ingredients. The titular ingredient, chocolate chips, as well as nuts are typically mixed in towards the end of the process to minimize breakage, just before the cookies are scooped and positioned on a cookie sheet. Most cookie dough is baked, although some eat the dough as is, or use it as an addition to vanilla ice cream to make chocolate chip cookie dough ice cream. The chocolate chip peanut butter cookie replaces the vanilla flavored dough with a peanut butter flavored one. Chocolate chip cookie dough baked in a baking dish instead of a cookie sheet results in a chocolate chip bar cookie. Other variations include different sizes and shapes of chocolate chips, as well as dark or milk chocolate chips. These changes lead to differences in both flavor and texture. ^ a b Stephanos, Maria (2017-06-21). "Secret's out! Here's the 'real recipe' for Toll House chocolate chip cookies". WCVB. Retrieved 2017-06-22. ^ a b Carolyn Wyman (2013). The Great American Chocolate Chip Cookie Book: Scrumptious Recipes & Fabled History From Toll House to Cookie Cake Pie. Countryman Press. p. 23. Retrieved Mar 21, 2014. ^ "Chocolate Chip Cookie Day and the accidental origin of this American staple". CNN. 20 October 2017. ^ Wakefield, Ruth Graves (1942). Ruth Wakefield's Toll House Tried and True Recipes. M. Barrows & Company, Inc.
^ Jones, Charlotte Foltz (1991). Mistakes That Worked. Doubleday. ISBN 0-385-26246-9. ^ "History of Nestlé Toll House". Archived from the original on 2009-02-23. ^ Burton's Biscuit Company. "Maryland cookies". Retrieved 27 March 2014. ^ William Francis Galvin, Secretary of the Commonwealth of Massachusetts. "Massachusetts Facts - State Symbols: Official Cookie". Retrieved 3 May 2018. ^ Levitt, Jonathan. "They're Not As Easy To Make As To Eat", The Boston Globe, 7 June 2006, C2. Available through ProQuest eLibrary. ^ Armbrister, W.L. ; Setser, C.S. (1994). "Sensory and Physical Properties of Chocolate Chip Cookies Made with Vegetable Shortening or Fat Replacers at 50 and 75% Levels". Cereal Chemistry. 71 (4): 344–351. Wikimedia Commons has media related to Chocolate chip cookies.